Rachel and Ryan’s destination Clearwater Beach wedding was reminiscent of the pair’s first trip together. The bride and groom chose a purple color palette for their beach wedding ceremony, followed by an outdoor, oceanside reception. “We started with dark purple because we liked how it stood out against the neutral colors of the beach and then ended up adding to it with other shades of purple. It was a lot of fun and loved the variety of colors,” Rachel beamed. Choosing a Clearwater Beach wedding venue on the Gulf of Mexico was a top priority for the couple. 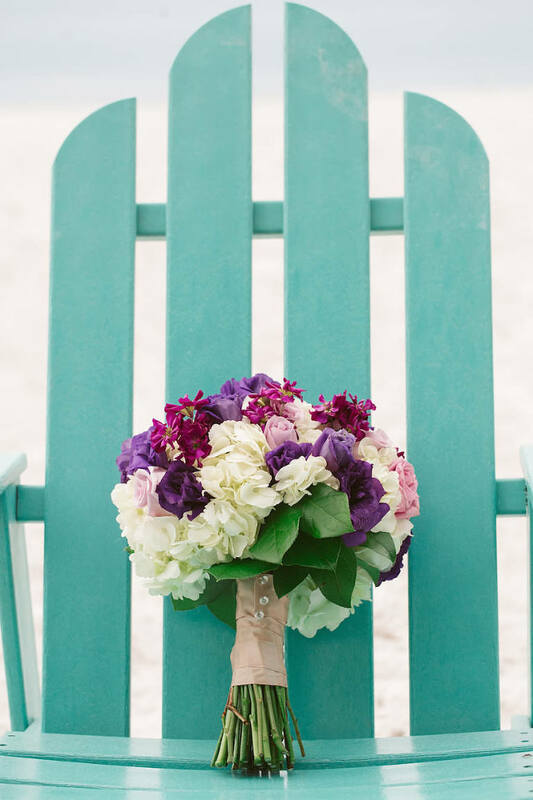 On the recommendation of their venue coordinator, the pair hired Clearwater Beach wedding florist Iza’s Flowers. 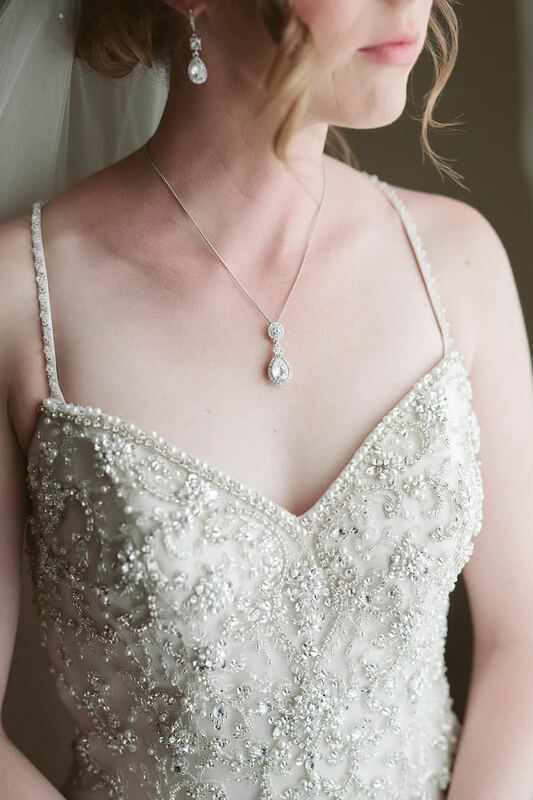 Looking back, the bride shared that one of her most cherished memories was seeing her husband-to-be for the first time on their wedding day. Ryan proposed at home with paper hearts, candles and Cadbury Creme Eggs (which he brought for me on our first date). We had dinner plans right after the proposal, and when I walked into the restaurant, Ryan’s parents and my mom were already there. He planned for them to be there and flew my mom in from out of state. It was perfect! We wanted a resort located right on the beach that offered a sand ceremony and an outdoor reception area. 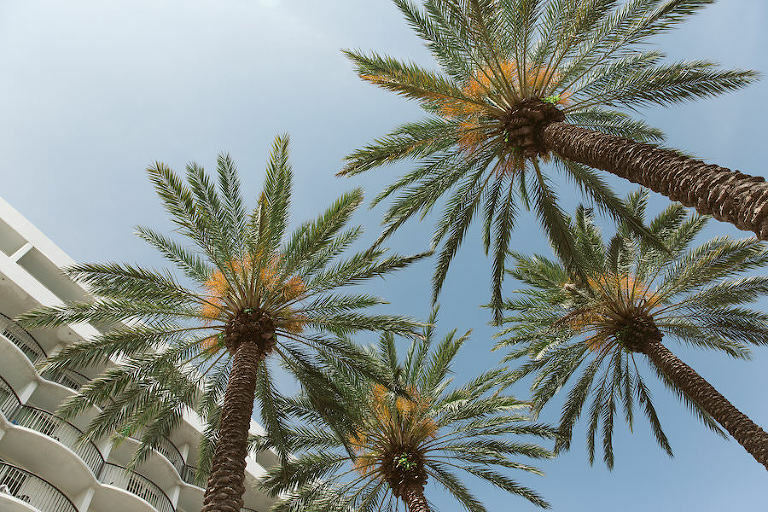 We chose the Hilton Clearwater Beach for so many reasons. We took our first vacation together there so there was a sentimental connection. The beach was private (which was awesome), so we didn’t have to worry about a lot of people being in all of our pictures. The location is excellent. There are so many places in walking distance to eat, grab a drink or take a boat ride, so we knew family and friends would enjoy their time outside of the wedding day. 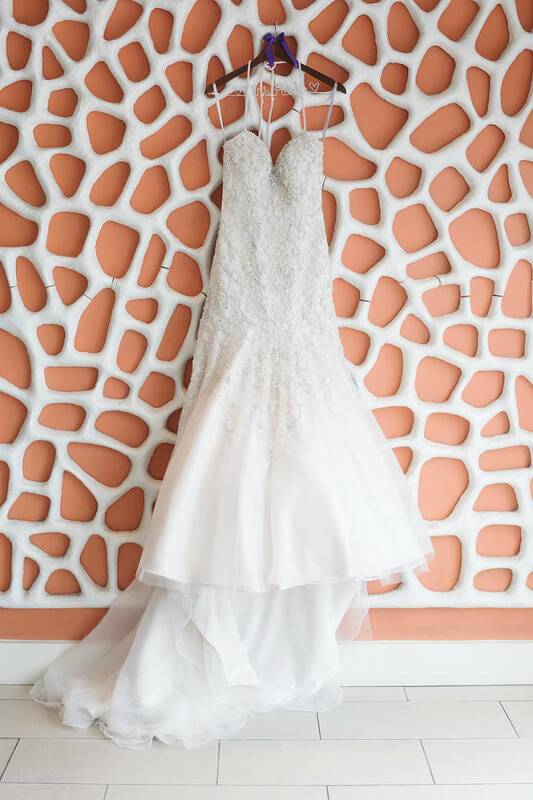 We loved the reception and ceremony, sites but what really made our decision easy was Courtney at the Hilton Clearwater Beach. We loved working with her! She answered all of my questions and helped make sure we had every piece of information we were looking for. She also had great recommendations for some of our other vendors. Courtney is fantastic! The service was also outstanding. Laurie from banquet services took great care of us at our tasting (which was over the top), and then on our wedding day. Everyone commented on the food and service at the wedding. I wouldn’t say we had a theme, but we tried to stick to a classic look. Shades of purple. We started with dark purple because we liked how it stood out against the neutral colors of the beach and then ended up adding to it with other shades of purple. It was a lot of fun and loved the variety of colors. We were looking for someone who was easy to work with and would take the ideas we had and run with them. We asked for recommendations from our venue, and Courtney couldn’t say enough to compliment Iza’s Flowers. Once I contacted her and we chatted on the phone, I realized she was exactly what we were looking for. She took the photos and ideas we had and made them come to life. Iza made sure to hand deliver and set everything up and was able to move some pieces from the ceremony to the reception. Her service was outstanding! She pinned the boutonnieres for the guys, hand delivered my bouquet and added some extra flowers on top of what we had discussed. The flowers made the ceremony and reception areas look amazing. What did you look for in a linen rental company? The linens added an extra touch of color and made the space stand out a little more. We were looking for a company that offered a color we liked and something with a little pattern. We hired Connie Duglin based on a swatch we saw in a book of swatches Courtney showed us at our tasting at the Hilton. We loved the color and the pintuck pattern on the fabric. Connie Duglin’s was great. They delivered directly to the Hilton, and it was billed through them so it was no extra work for us. We wanted someone who would play fun music and get everyone out enjoying themselves. We hired Grant Hemond & Associates based on recommendations. Once we hired them, we had even more vendors tell us how great they are and suggested a couple of specific DJs. They did not disappoint! Cory was great! He played exactly the type of music we wanted for cocktail hour and then did a great job with the rest of the reception. The dance floor was never empty! He even went above and beyond by bringing us a new drink when we would run out and staying until the rain and wind came down so hard we couldn’t stay. Decide what one or two vendors are most important to you and your fiancé. Book them first then ask them for recommendations on other vendors. They know who will offer the service you are looking for, and it’s a lot of fun to see them all work together when they know each other so well from other events. Consider the “first look” as an option. We didn’t want to do it, but decided to just to spend more time with our guests, and we are so happy we did. We loved every minute of that time together and will always remember that moment which was just ours.